Tuesdays I usually work in my studio all day and I have no time or energy to fix dinner, but I always want something satisfying. Sometimes in the middle of summer I will get a mad craving for what is typically winter or holiday food. Last summer I was craving Thanksgiving and I made Cranberry Chicken with stuffing. Today it’s Ham and Twice Baked Sweet Potatoes. This is perfect for take out Tuesday because it is so simple, quick, and completely unexpected for this time of year! I think this craving occurred because we have been having so much grilled meat and seafood lately, my tastebuds were yearning for something different! 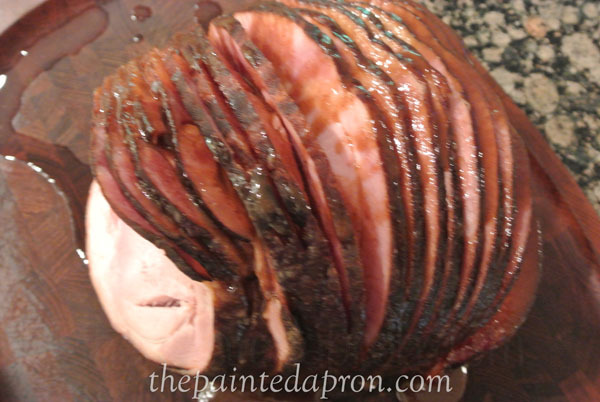 I picked up a spiral sliced ham at Costco and just baked and glazed it according to the package directions. Obviously, there was a ton left over which I will divide up, wrap in freezer paper and stash it away for future meals. Another favorite meal that is simple to make is ham and biscuits, we love that for breakfast or dinner, so I try to keep biscuits in the freezer too. These potatoes took about 4 minutes to prepare, seriously! It’s a good thing that sweet potatoes taste so good because they sure are ugly little devils! 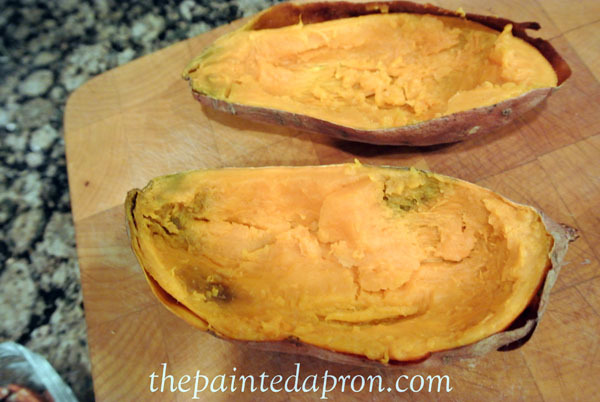 Just bake the sweet potatoes for 45-60 minutes. Let cool enough to handle and scoop out the insides, leaving enough potato to keep the shell in tack. 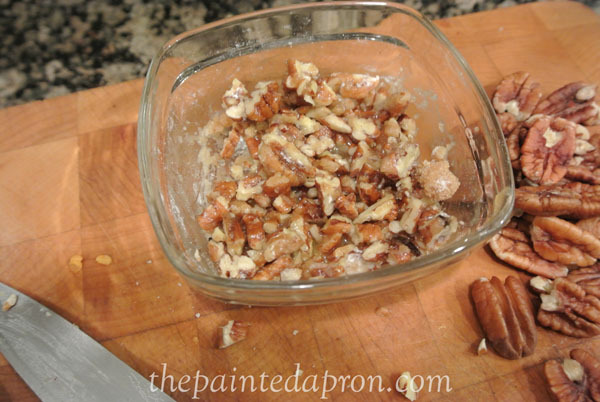 Fill the shells with the potato mash and top with pecan mixture. At this point they can be refrigerated until later. Bake at 350 for 20-30 minutes until hot. Omit the bourbon if you like, but it does add a nice depth to the flavor. Enjoy! Here’s the recipe for the potatoes, plan on 1/2-1 whole potato per person, these aren’t very big and you will wish you had more! Pierce the sweet potatoes a few times with a fork, bake in a preheated 400F oven until tender, about 45-60 minutes and let cool. Cut the potatoes in half lengthwise, scoop out the flesh leaving 1.4 inch on the skin. 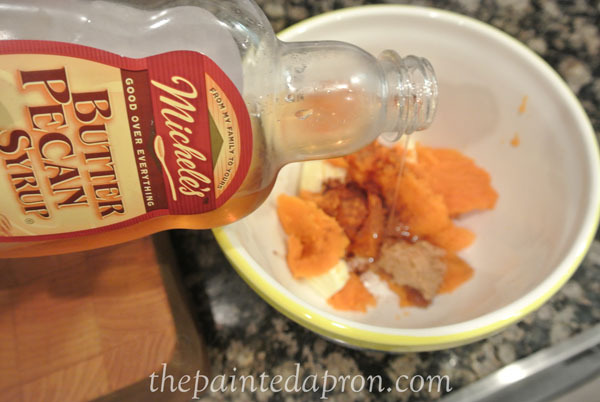 Mix the sweet potatoes with the butter, brown sugar, maple syrup, bourbon and cinnamon and spoon it back into the skins. 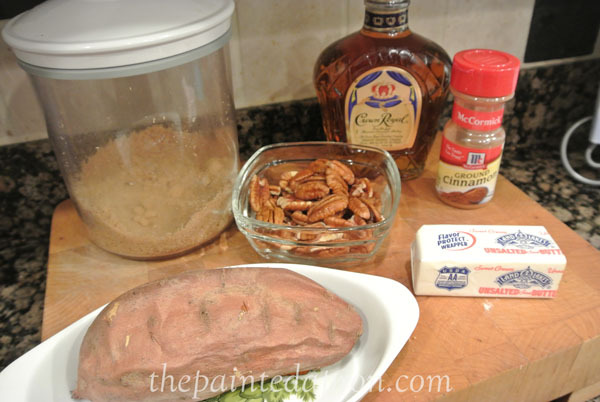 Mix the brown sugar, flour, butter, pecans and cinnamon until it starts to form crumbs and sprinkle it onto the stuffed potatoes. Bake in a preheated 350F oven until the topping is a light golden brown, about 20 minutes. This sounds delicious! 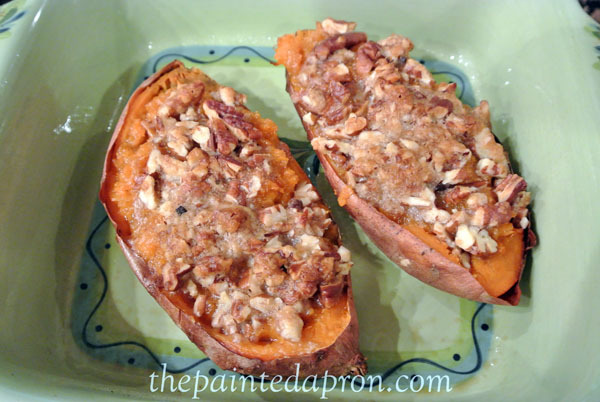 We’re always big fans of sweet potatoes! My mouth is literally watering…what a fabulous idea! My husband would love these. This would be perfect to link up to my Create It Thursday post…it’s live now! 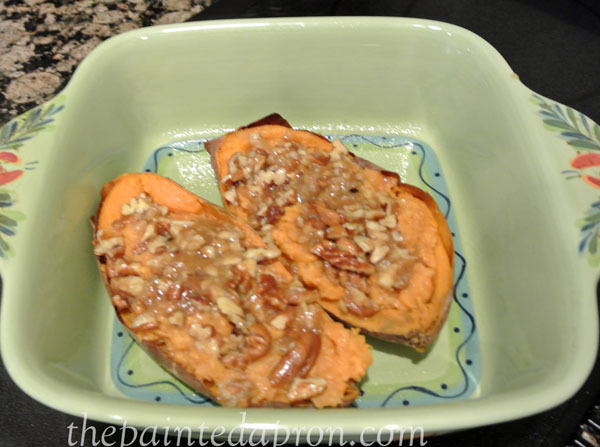 I just booked marked this recipe, my Mom loves sweet potatoes and I will fix this when she comes down. Thank you for sharing the recipe on BBQ Block Party. That looks so good. I would totally keep the bourbon in. I’ve never tried the syrup before but I see it often. I’m thinking it’s time I give it a try. Will be saving this recipe. You had me at potato and then you added brown sugar, maple syrup, pecans and BOURBON! I could skip the ham and just have the sweet potato! I’ll have to look for the Butter Pecan Syrup next time I’m at Target.